I was raised writing thank-you notes. As Pastor’s kids in a dual rural church parish, we were adopted by the families of both churches. Christmas came not only with the annual Open House but also with precious gifts left for my brother and I under the tree by many from our church families. Add this to the blessings of grandparents, aunts, uncles and cousins and we were showered with gifts. And so… the first week of January included, without fail, my brother and I at the kitchen table, each with our list and a stack of blank thank-you notes. At times, we balked. We were, afterall, kids. But we always, always, always got them done. It’s a lesson I carried forward into the world outside of my parents’ home. I wish I could say I maintained the discipline to write them for every occasion, but I haven’t…. But when I do write thank-yous , I WRITE thank-yous, for the lesson I learned is that though the material gifts may inspire me to sit down and write, it’s not the gifts, necessarily, for which I’m most thankful. These are the things for which I give most thanks, and the aspects I strive to include in my thank-yous. Tonight I sat down with my list and a stack of blank thank-you notes. The occasion? My 50th birthday party. A surprise spearheaded by my husband and made complete by the the folks who made time in their week to be there. We laughed. We hugged. We visited. We shared. I opened lovely gifts and perfectly perfect cards. Each and every one the exact thing I never knew I needed. And so I’ll tackle my list. I won’t balk even once. And I’ll thank my friends and family for not only the gifts they brought, but the love and laughter they shared. You are so right; the thing we are most thankful for is the people and the love they show us. 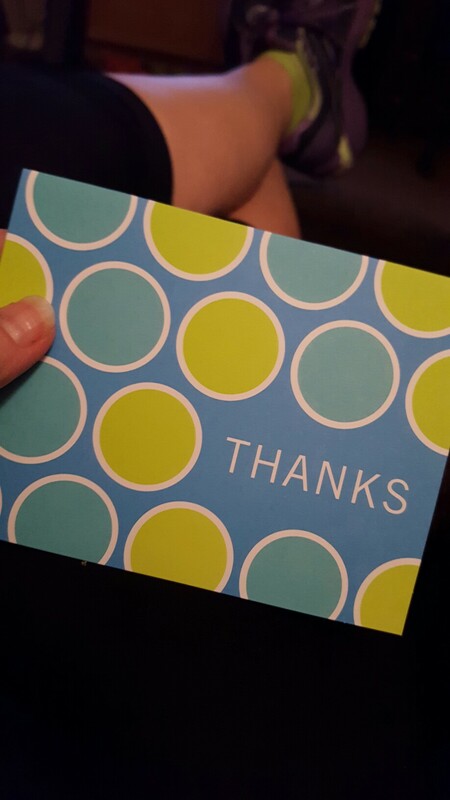 I confess I have gotten really bad about writing thank you cards and making my kids write them. Your slice inspires me to renew my efforts.